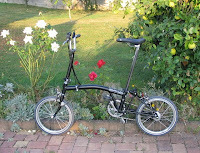 Way back in June (18th) I mentioned I had ordered a Brompton folding bike. It was in Brussels by the end of August, but I only managed to get it to Strasbourg last week. First impressions are positive, as you might have hoped, considering the price! It folds very neatly & that should be a good party piece after a bit more practice. 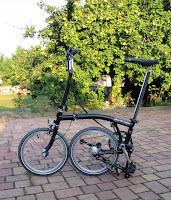 The way it parks itself with the back wheel tucked underneath is handy, if not exactly elegant, but who can walk away from a casually-parked 760€ bike these days? I have not investigated, but I suppose one collateral benefit is that you can lock up the frame & both wheels with one small lock, if you fold everything completely first. It doesn't feel as wobbly as other folders I have tried, though the stability is not enough to encourage any "no-hands" stuff yet. A good surprise is the easy, efficient way it rolls on smooth surfaces – no doubt a direct result of the 90psi in the tyres. Wobbliness & inefficiency were my main fears, so it's off to a good start. The down side of the tyre pressures, and of the small wheels, is the "high-fidelity" ride quality – no detail of the road surface is lost in transmission! Already, I am paying a lot more attention to even smallish pebbles & absolute attention to transverse gullies, the consequences of which are only too easy to imagine. Obviously, mud, sand & gravel are out of the question. The strange gears (very wide ratio Sturmey-Archer 3-speed hub & close-ratio 2-speed derailleur) have an adequate range of 3.0:1 & acceptable (for me) spacing, but I would certainly prefer a decent 7/8/9-speed hub gear. 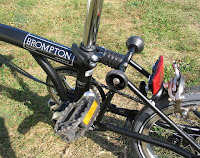 Or even a cheaper 5 or 6-speed hub with 3.0:1 range if such a thing existed (hint!). I am getting the hang of compound changes – simultaneously up on the hub & down on the derailleur - but it all requires constant attention & detracts from the idle pleasure of just riding. What I notice most often, is how vulnerable I feel with no mirror. That's not a criticism of the bike, but a reminder to myself to get a vibration-free mirror (which won't interfere with folding…) asap. What I notice most acutely, is the severe pain & bleeding in both ankles! Caused by inevitable & predictable collisions with the stupid little parking wheels, cunningly positioned to be exactly where your ankles pass on every turn of the cranks. I find this absolutely incredible. How can you produce, for over 20 years, an expensive device which unfailingly, painfully, injures its owner?